Bacteria that colonize and form biofilms on living tissues and medical devices are a global healthcare concern. They cause life threatening infections and are associated with increased mortality and morbidity in the hospitals. Although antibiotics have been successfully applied for treatment of bacterial diseases, the adaptive and genetic changes of the microorganisms within the biofilms make them inherently resistant to all known antibacterial agents. Therefore, novel antimicrobial strategies that do not exert selective pressure on bacterial population and minimize the risk of resistance occurrence have been sought to prevent and treat biofilm related infections. A critical overview of the numerous groups and the rationale of advanced materials and surfaces with antibacterial and antibiofilm properties is the aim of this review. The development of antibiofilm coatings based on molecules interfering with bacterial cell-to-cell communication and biofilm integrity are discussed. Nano-scale transformation of obsolete antibiotics and surface functionalization with bacteriophages and natural antibacterials including enzymes, antimicrobial peptides, and polyphenols are also considered. Finally, recent efforts to design new generation of integrated antibacterial materials are reported. Keywords: Biofilm prevention, Antimicrobial peptides, Polyphenols, Bacteriophages, Enzymes, Nanoparticles, Drug resistance. Keywords:Biofilm prevention, Antimicrobial peptides, Polyphenols, Bacteriophages, Enzymes, Nanoparticles, Drug resistance. Abstract:Bacteria that colonize and form biofilms on living tissues and medical devices are a global healthcare concern. They cause life threatening infections and are associated with increased mortality and morbidity in the hospitals. Although antibiotics have been successfully applied for treatment of bacterial diseases, the adaptive and genetic changes of the microorganisms within the biofilms make them inherently resistant to all known antibacterial agents. Therefore, novel antimicrobial strategies that do not exert selective pressure on bacterial population and minimize the risk of resistance occurrence have been sought to prevent and treat biofilm related infections. 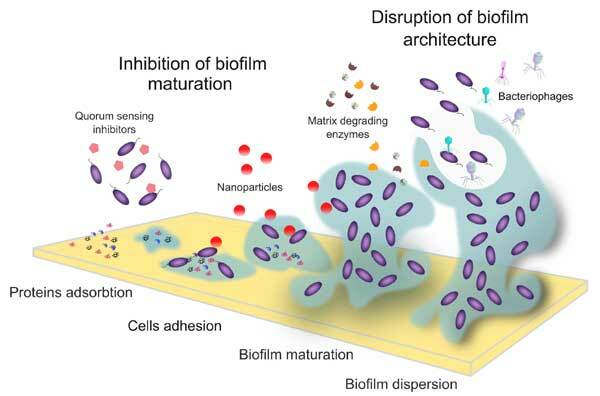 A critical overview of the numerous groups and the rationale of advanced materials and surfaces with antibacterial and antibiofilm properties is the aim of this review. The development of antibiofilm coatings based on molecules interfering with bacterial cell-to-cell communication and biofilm integrity are discussed. Nano-scale transformation of obsolete antibiotics and surface functionalization with bacteriophages and natural antibacterials including enzymes, antimicrobial peptides, and polyphenols are also considered. Finally, recent efforts to design new generation of integrated antibacterial materials are reported.